James Dale Thiessen was born at home, near Munich, North Dakota, to Abraham A and Marie (Hoffman) Thiessen on August 30, 1927. 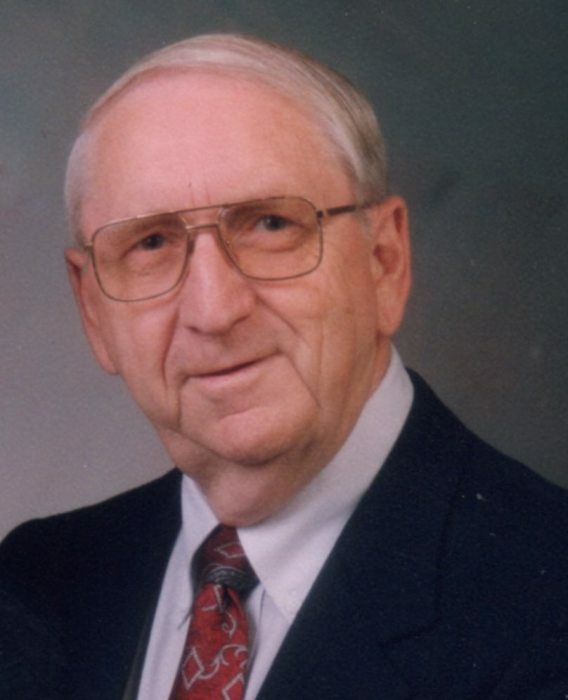 He entered Heaven’s gates on the morning of January 28, 2019 at Kidron Village in North Newton, Kansas. His only sibling, a sister Olga, was eleven years old when James was born. She taught him to speak English before he entered first grade since Low German was spoken at home, and High German was spoken in church. He grew up on the family farm, learning to haul grain in a wagon pulled by a team of horses at the age of ten. James enjoyed hunting, playing marbles, farm chores, school and church activities in his early years. At the age of ten James met nine-year-old Gladys Ruth Heppner for the first time. Her family had recently moved to the Alsen, ND, area from Lostwood, ND, and their families attended the same church. They began dating when James was seventeen, and Gladys was sixteen. They were married in the Salem Mennonite Church, Munich, ND, on September 24, 1947. Soon thereafter, in the space of ten years, five children arrived, and parental joys and challenges ensued for James and Gladys. Education became a high priority early in James’ life. He graduated from Bethany Bible Academy, Munich, ND, at age 16, followed by a Bachelor of Arts degree in Bible & Philosophy from Grace College of the Bible, Omaha, NE, in 1953. He earned a Bachelor of Science degree in Education (1955) and a Masters degree in Education (1957) from Northeastern State University, Tahlequah, OK. Further academic studies followed, attending Emporia State University and Wichita State University. These academic studies prepared James for a lifetime of teaching and administrative positions including Pastor of the Cumberland Presbyterian Church (1956-1966) and Principal of Markoma Bible Academy (1961-1966), both in Tahlequah, OK. In 1966 James accepted the position as Superintendent of Berean Academy (1966-1994) in Elbing, KS, where he served twenty-eight graduating classes, and experienced much joy working with students, teachers, administrators, and staff. At age 69, in 1996, James began an affiliation with ACSI (Association of Christian Schools International). He served twelve years on the Board of Directors for ACSI, and led twenty-two accreditation teams, including four trips to Guam and Saipan, and one trip to Portugal. James & Gladys determined early in their marriage that their priority in this life together would be following their Lord and Savior Jesus Christ, wherever He would direct them. And this calling led them to invest their lives in education that is Christ-centered as to its worldview, using the Bible as the foundation for interpreting life, both now and life in eternity to come. James’ passion for living was centered in knowing and experiencing Jesus, God’s Son, our Savior. His servant heart was fulfilled with experiences as a loving husband, father, pastor, high school teacher and administrator, Sunday School teacher and elder of Whitewater Community Church (formerly Swiss Church), board member of various organizations, grandfather and great-grandfather. James is in Heaven now, and leaves behind the love of his life, Gladys of North Newton, KS, and their children, Karen and Irv Busenitz of Santa Clarita, CA, Kerwin and Julie Thiessen of Valley Center, KS, Korrene and Michael Keenan of Houston, TX, Keith and Deb Thiessen of Omaha, NE, and Kenneth and Marchel Thiessen of Valley Center, KS, ten grandchildren, and fifteen great-grandchildren.